OBV MP Shadowing Scheme Graduate Mohammed Ibrahim Ullah talks about his experience on this year's MP Shadowing Scheme. I was paired with Rushanara Ali, MP for Bethnal Green and Bow, who became the very first British Bangladeshi to be elected to the House of Commons in 2010. As a fellow British-Bangladeshi, one can imagine how delighted I was to be paired up with her. Unlike most Shadows, who spread their shadowing days over the course of several months, my shadowing days were compacted into one intensive week in Westminster with Rushanara. And my word, what a week that was! Although she was extremely busy, she made sure that I had an all-round balanced experience of both shadowing her and working in her offices in Westminster and constituency. She took me along to some really interesting meetings, events and venues. This included attending the highly publicised International Somalia Conference reception at the FCO, St James Palace, a Westminster Hall meeting, and a school opening ceremony in her constituency. Not only did she want to make sure I had a broad experience of her life as a Parliamentarian, she was also keen for me to learn and appreciate just how important the role of an MP's office plays in organising and managing their affairs. Along with a host of other things, I was highly impressed with the way Rushanara went out of her way to introduce me to almost everyone we come across. This even included high profile members (and some Cabinet Ministers) of the Conservative Party. She didn't want to me fade away in the background; instead she always encouraged me to come to the fore and get a taste of some of her daily activities. Out of everyone she introduced, I was most delighted to meet a Labour legend and my personal hero, Dennis Skinner MP, who kindly accepted my request to meet up for a coffee. My local MP, Paul Blomfield, also met up with me in Parliament, which helped put me at ease with the prestigious place. This OBV MP Shadowing Scheme was unique in that it provided both effective indoor training sessions for knowledge and skills development and practical shadowing experiences. Together, these increased our chances of working through the complex political system. I can't praise enough the quality of the training days: the motivational speeches, group exercises and high-profile guest list were all brilliant. Some of the training group tasks, for instance media training, really tested us and made was aware of the type of skills we must master or certainly acquire before we seek for a public office. Simon Woolley was absolutely phenomenal with his inspirational speeches and it worked wonders on all parliamentary shadows, including me. Everything was geared up to boost our self-confidence and the belief that we too can play a part and make a contribution to our great democratic system. Believing in OBV's messages, I finally made my first symbolic application for a by-election in Bradford West. This is something which I wouldn't to do, even in my wildest dreams, only a few months earlier. Sitting on the train home, I still couldn't believe that I had just visited one of the most famous addresses in the world, a national monument which was once described as a "vast, awkward house" by William Pitt the Younger and now functions as the HQ for Her Majesty's Government; 10 Downing Street. It's frightening to think of the enormous history behind and in front of that big unassuming black door which for centuries, has been the command centre for British Premierships to run the vast British Empire including my country of origin, Bangladesh. This was truly a memorable visit and only made possible thanks to my participation on the MP Shadowing Scheme. From the abundant number of past and present alumni of this scheme, I am confident that OBV's mission to tackle the BME representation deficit will succeed in time. Through constant reminders and increased demand, there will be more proportionate Black and ethnic representation at every level of our political system and in society as a whole. The tide is changing; the old William Pitt generation of White elite aristocracies are long gone. 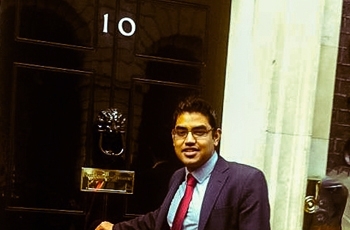 We are all part of the new Obama generation where anything is possible, including seeing a Black man or woman walking through the door of Number 10. Finally, I would like to say a big thank you to OBV for giving me the opportunity to participate in this year's MP shadowing scheme. Francine and Jyoti have done a fantastic job in organising the whole scheme with minimal resources and they can be proud of their contribution in nurturing the next generation of BME MPs.